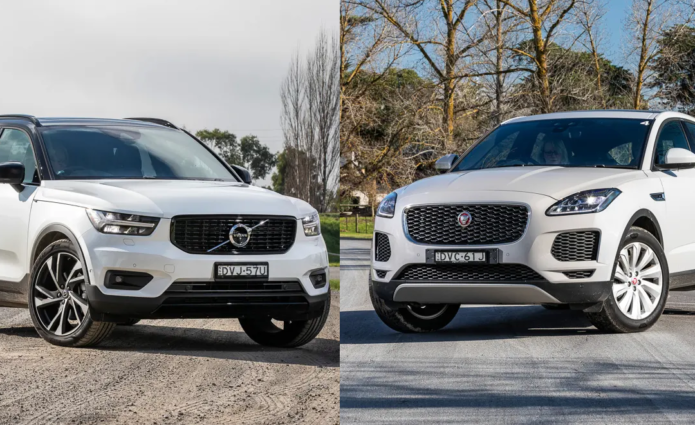 Fashionable compact SUVs from Jaguar and Volvo shape up to each other, but will it be the E-PACE or the XC40 that takes the win? A Jaguar versus Volvo comparison? Up until recently that would have meant a couple of sedans going at it, like the X-Type (remember that?) and S40. Or the S-Type (remember that?!) and S60. But nowadays we’re talking SUVs, in this case the freshly launched compact E-PACE and XC40. They are both five-seaters, have a distinctive style and charge a price premium for the privilege of owning them. Why are we comparing them? Fashionable small SUVs are a growth market and these are two of the latest and most fashionable among them. They spec up very close together in several ways, including their petrol four-cylinder engines and compact dimensions. Obvious rivals include the Audi Q2 and Q3, BMW X1 and X2, Mercedes-Benz GLA, Lexus NX, Infiniti QX30 and the MINI Countryman. Designed and engineered by a British-based Indian-owned company, built in Austria and on-sale in Australia since March, the E-PACE launched with a huge line-up of models. We’re testing the S P250, which is one up from entry-level. It’s powered by 2.0-litre turbocharged engine that makes 183kW/365Nm and mates to a nine-speed automatic and all-wheel drive. Designed and engineered by a Swedish-based Chinese-owned company, built in Belgium (but maybe soon China) and on-sale in Australia since April, the XC40 offers a less comprehensive line-up, in which our test T5 R-Design Launch Edition is one of the premium models. T5 denotes a 185kW/350Nm 2.0-litre turbo-petrol engine that mates with an eight-speed auto and all-wheel drive. Among other things, R-Design means a sportier look (note the black roof) and suspension. Launch Edition brings with it some extra gear, which we’ll get in to below. Who will they appeal to? People who value a bit of badge cred and are prepared to spend extra for it. After all, you can get most of the key equipment found in these two for many thousands of dollars less in vehicles of a similar size like the Mazda CX-5, Volkswagen Tiguan and Hyundai Tucson. Measuring up at well under 4.5m long, these are really cars for singles, couples and maybe families with young kids. If you want full-size family transport then look further up the Jaguar line to the F-Pace or Volvo’s XC60 and XC90; or elsewhere to a plethora of SUV offerings. The recommended retail price before on-road costs for the E-PACE is $57,600, but a heap of optional extras pumped it up to $70,880, meaning it’s well into luxury car tax territory. The XC40 started at $56,740 and really only hiked slightly to $57,890 before on-road costs. But it’s a bit of an unfair comparison because the Launch Edition XC40 has sold out. A standard XC40 T5 R-Design will set you back $54,990, but also misses out on $6500 worth of extra gear (Volvo’s estimate). So what do you get standard in these vehicles? The Jag comes with six airbags, the Volvo adds a driver’s knee airbag. Both get autonomous emergency braking, lane keep assist and blind spot monitoring, a reversing camera, rear cross-traffic monitoring, front and rear parking sensors, LED headlights (active bending for the Volvo) and ISOFIX child-seat mountings. Comfort and other equipment include leather trim, dual-zone climate control, alloy wheels (18-inch for the Jag and 20-inch for the Volvo), sat-nav, keyless go, passive cruise control and a wireless hot spot. Only the Volvo gets paddle shifters, Apple CarPlay/Android Auto smartphone connection, wireless charging and a power tailgate standard. The Jag gets lots of this stuff optionally. Both have a temporary spare tyre. And just in case you’re interested, the R-Design Launch Edition’s extras include a sunroof, alarm, heated front seats, adaptive cruise control with Pilot Assist, Park Assist Pilot, a Harman Kardon audio system and 360-degree camera system. In terms of running costs, both claim 7.7L/100km with the aid of idle-stop. The E-PACE comes with a three-year/100,000km warranty, the XC40 three years/unlimited kilometres. Jaguar service intervals are not fixed, but five years or 130,000km will cost you $1500. The Volvo is 12 months/15,000km and a basic service plan will set you back $2165 over three years. Based on the same all-steel monocoque chassis as the Range Rover Evoque, the Jaguar has a really nice ride and handling balance. It’s more forgiving over the bumps than the Volvo and backs that up with crisp body control and communicative steering. At low speeds the XC40’s steering is lighter. Combine that with an 11.4m turning circle versus 11.9m for the E-PACE and that delivers the carpark battle to the Volvo. Get up and rolling and the XC40 is very close to the Jaguar dynamically and way ahead of Volvo’s traditionally mediocre efforts. The Volvo has the advantage when it comes to the drivetrain. Its Drive-E engine is light, lively pretty much lag-free and mates brilliantly with its auto; it can be tuned through different mode (optional for the E-PACE S) and just shades the perfectly acceptable Jaguar Ingenium engine and its auto. The Jaguar does fight back with a tunable instrument panel graphic that allows an Audi-esque full-size sat-nav screen. But that is optional. The Jaguar also has slightly more rear seating space and luggage capacity than the Volvo, with 484 litres versus 460. The XC40 has more storage places though, including a nifty tray under the driver’s seat and various bins and hooks. The Jaguar lacks the Volvo’s high-quality presentation inside, its leather trim doesn’t look or feel as good and it could do with a more intuitive infotainment system. Figuring out how to manually tune the radio was a real challenge. The system also took a while to wake up when you keyed the ignition and the reversing camera didn’t always appear when reverse gear was selected. Another detail glitch was the idle-stop system’s occasional hesitation to re-fire. No good when you’re looking to make an incisive jab into traffic. The E-PACE also had a few more squeaks and rattle than the XC40. The Volvo, riding on a new compact architecture developed with parent Geely, had a jittery low-speed ride by comparison with the smooth Jaguar. That was something exacerbated by low-profile and expensive 20-inch rubber, which also generated more road noise. Go for the no-cost option of smaller wheels and tyres with more sidewall if you can. The Volvo also feels a little claustrophobic in the back, something exacerbated by the ‘form over function’ kick in the rear windows. Small kids would struggle to see out of this thing. These are two really decent small wagons, but the Volvo is better value, has a higher quality interior and a wonderful drivetrain. The Jaguar is more enjoyable dynamically and has a more open second row, but that’s not enough to redress the balance. The XC40 really offers the impression Volvo’s engineers and designers have been given permission to have a real crack. The result is a credible, cool contender in this oh-so fashionable segment. How much does a Jaguar E-PACE P250 S cost? How much does a Volvo XC40 T5 R-Design Launch Edition cost?